The A&W Classic Car Meet! The A&W Classic Car meet showcases local Calgary car owners' restored, and modified classic cars to the modern era of muscle cars. 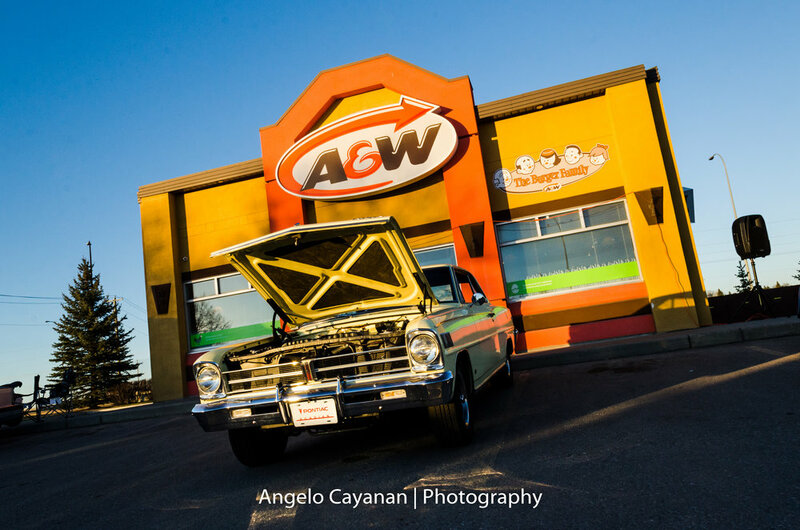 A few weekends ago A&W played host to the classic car meet, and there were a lot of eye candy! First of all, the 1971 Plymouth Hemi 'Cuda in sublime green! This photo doesn't do it enough justice, it is a masterpiece; aside from the fact that it's a rare occasion seeing one. There was a tag by the windshield warning not to touch, since the parking lot wasn't really the most spacious, I had to do with the exterior shots. The favorite of hot rod enthusiasts and probably the most popular among hot rod builders; the 1930's Ford Model A. I'm not sure if the parts are easier to get, or if its the easiest to build but nonetheless Model A's are the common ones I have seen. It doesn't matter though because no one car is a like, every one that I have seen are different. This is no exception it is a thing of beauty! A Chevy Chevelle, a car that is not to be taken lightly. Unfortunately, the owner wasn't around to be able to speak to and get to know the car better. Judging from the exterior, he has restored this beauty to it's former glory and I can appreciate that! The hood doesn't need to be open to give respect to this car! On a side note, the wax can be seen at the rear logo, just shows how it is being taken care of on a regular basis aside from the fact that it's being showcased in a car show. The recognizable, and makes everyone's top muscle car list - 1969 Chevrolet Camaro. It is marked the last of the first generations and is arguably the most popular. During the time of its release, Chevrolet had offered a lot if configurations for the Camaro. They had the standard Sport Coupe, the Super Sport - which I think based on the name is quite powerful, and the Z28 - track ready of course. And to top it all of, the optional package of nice carpeting, bucket seats, special stripes and wheels, and the hidden head lights. This particular Camaro is none of those configurations because this car has "The One with a Name Like the Hiss of a Snake" so to speak. Yes, it is the SS version of the Camaro. Big power, sport striping, heavy insulated hood, and 3-speed transmission. A classic car meet wouldn't be complete without a custom built vehicle! Next up, is this custom 1970 Dodge Charger. This isn't like Dominic's car but instead I think it still holds the same effect where anyone who spots this will pay its respects. Looking at the front grill, the owner hid the headlights behind a chrome grill, which I think adds personality to the car and gives cleaner lines. I was trying to get the interior on the second picture, then I saw the logo on the side. If you can imagine it, the owner essentially continued the slope of the roof from the rear all the way down to the trunk. Making a silhouette that is smoother in aesthetics and aerodynamics as well. What kind of person would I be if I didn't get a shot of the sponsors. 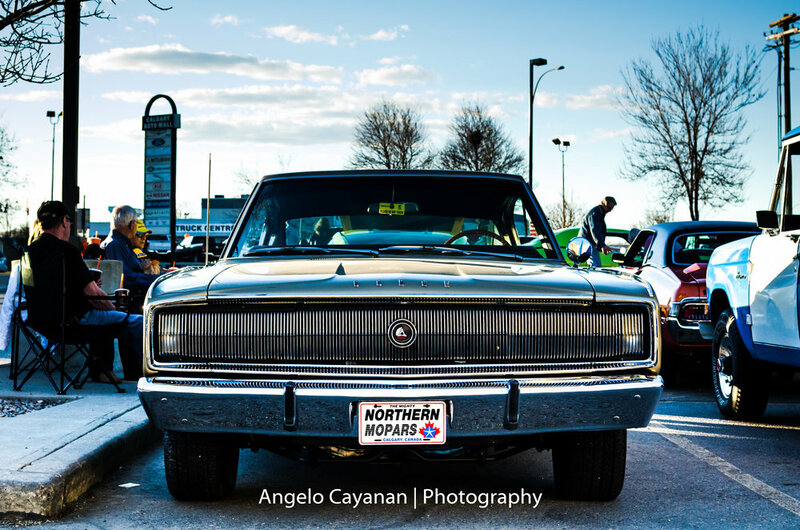 Cheers to a successful classic car meet to A&W, and hopefully they can get more cars involved next year!